Be the first to share your favorite memory, photo or story of Haskell. This memorial page is dedicated for family, friends and future generations to celebrate the life of their loved one. 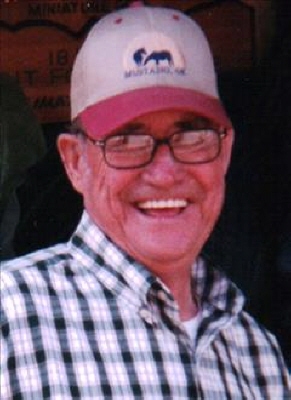 Haskell M. Scalf, age 80, a longtime resident of Altus, Oklahoma, passed away Saturday, March 16, 2019 at Jackson County Memorial Hospital in Altus. Haskell was born in Matoy, Oklahoma the fifth of ten children on August 17, 1938 to his parents Harvey Metz Scalf and Clara Bell (Peek) Scalf. At an early age the family moved to the Altus Elmer area of Oklahoma where Haskell was raised. He attended school at South Side in Elmer. On February 18, 1958 Haskell married the love of his life Rebecca Evaline Payne in Elmer, Oklahoma and they have enjoyed over 61 years of marriage together. As a young couple they settled in Elmer and later moved to Altus where Haskell has resided for many years. In his early life he worked at the Cotton Growers Gin in Altus and later worked for Marks Lumber Company in Altus for over twenty years before retiring. Haskell was a longtime deacon at the Trinity Baptist Church in Altus and for the last several years Haskell had been attending the First Baptist Church in Altus. In his spare time he enjoyed fishing and wood working and he was known by many for his homemade vanilla ice cream. But more than anything Haskell loved his family and enjoyed family reunions and get-togethers and he always treasured the time spend with his grandchildren. Preceded in death by his parents; three brothers, Floyd Scalf; William Scalf; and James Ray Scalf; two sisters, Sharon Kay Scalf; and Faye Parsley. Haskell is survived by his loving wife Evaline Scalf of the home; three children, Becky Spearman and husband Don of Seattle, Washington; Leon Scalf and girlfriend Tia Damerron of Altus; and James Scalf and wife Carol of Oklahoma City; two brothers, Gerald Scalf and wife Julia of Cordell, Oklahoma; and Waylon Scalf of Duke, Oklahoma; two sisters, Cora Bell Smith of Kentucky; and Lahonda Carter of Altus; eight grandchildren; nine great grandchildren with two on the way; two great grandchildren; numerous nieces and nephews; as well as many other family members and friends. The family will greet friends at Visitation from 6:00 pm until 8:00 pm on Wednesday evening, March 20, 2019 at Lowell-Tims Funeral Home in Altus, Oklahoma. Funeral services will be at 2:00 pm on Thursday, March 21, 2019 at the Lowell-Tims Funeral Chapel in Altus, Oklahoma with Dr. Jeff Moore officiating. Interment will follow services at Altus City Cemetery under the direction of Lowell-Tims Funeral Home and Crematory, Altus, Oklahoma. To send flowers or a remembrance gift to the family of Haskell M. Scalf, please visit our Tribute Store. "Email Address" would like to share the life celebration of Haskell M. Scalf. Click on the "link" to go to share a favorite memory or leave a condolence message for the family.